Aluminium (in American English also: aluminum) is a chemical element. 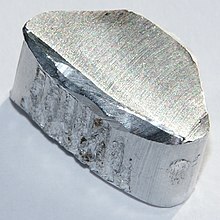 The symbol for aluminium is Al, and its atomic number is 13. Aluminium is the most abundant metal. Aluminium is a very good conductor of electricity and heat. It is light and strong. It can be hammered into sheets (malleable) or pulled out into wires (ductile). It is a highly reactive metal, although it is corrosion resistant. Aluminium prevents corrosion by forming a small, thin layer of aluminium oxide on its surface. This layer protects the metal by preventing oxygen from reaching it. Corrosion can not occur without oxygen. Because of this thin layer, the reactivity of aluminium is not seen. Pure aluminium is made from bauxite, a kind of rock that has aluminium oxide and many impurities. 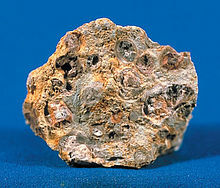 The bauxite is crushed and reacted with sodium hydroxide. The aluminium oxide dissolves. Then the aluminium oxide is dissolved in liquid cryolite, a rare mineral. Cryolite is normally produced artificially though. The aluminium oxide is electrolyzed to make aluminium and oxygen. Aluminium was once considered a precious metal that was even more valuable than gold. This is no longer true because, as technology improved, it became cheaper and easier to make pure metal. Aluminium forms chemical compounds in the +3 oxidation state. They are generally unreactive. Aluminium chloride and aluminium oxide examples. Very rarely are compounds in the +1 or +2 oxidation state. Pure aluminium is very soft, so a harder metal is almost always added. The harder metal is usually copper. Copper/aluminium alloys are to make ships, because the aluminium prevents corrosion, and the copper prevents barnacles. Aluminium compounds are used in deodorants, water processing plants, food additives, and antacids. Since aluminium needs to be made by electrolysis, it requires a very large amount of electrical power. 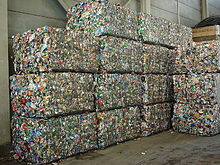 Recycling aluminium would be much cheaper. That's why recycling plants were opened. The cost of recycling aluminium is much less than the cost of making it from bauxite. Aluminium is not used in the human body, although it is very common. People debate whether its use in deodorants and water treatment is healthy. Aluminium ions slow down plant growth in acidic soils. Aluminium may be a factor in Alzheimer's disease (a disease when the brain stops working and the patient is confused). But the Alzheimer's Society says overwhelming medical and scientific opinion is that studies have not convincingly demonstrated a causal relationship between aluminium and Alzheimer's disease. ↑ Dohmeier, C.; Loos, D.; Schnöckel, H. (1996). "Aluminum(I) and Gallium(I) Compounds: Syntheses, Structures, and Reactions". Angewandte Chemie International Edition 35: 129–149. doi:10.1002/anie.199601291. ↑ D. C. Tyte (1964). "Red (B2Π–A2σ) Band System of Aluminium Monoxide". Nature 202 (4930): 383. doi:10.1038/202383a0. ↑ Ferreira PC, Piai Kde A, Takayanagui AM, Segura-Muñoz SI (2008). "Aluminum as a risk factor for Alzheimer's disease". Rev Lat Am Enfermagem 16 (1): 151–7. doi:10.1590/S0104-11692008000100023. PMID 18392545. http://www.scielo.br/scielo.php?script=sci_arttext&pid=S0104-11692008000100023&lng=en&nrm=iso&tlng=en. ↑ Rondeau, V.; Jacqmin-Gadda, H.; Commenges, D.; Helmer, C.; Dartigues, J.-F. (2008). "Aluminum and Silica in Drinking Water and the Risk of Alzheimer's Disease or Cognitive Decline: Findings From 15-Year Follow-up of the PAQUID Cohort". American Journal of Epidemiology 169 (4): 489–96. doi:10.1093/aje/kwn348. PMC 2809081. PMID 19064650. This page was last changed on 14 January 2019, at 19:20.